The Scrappy Signs Collection is and assortment of stock and custom Handpainted Barnwood Signs by Rented Mule. All barnwood items are AMERICAN MADE PRODUCTS, . Each Scrappy Sign is unique in size and color due to the natural aging process of the wood. All Scrappy Signs are made from Reclaimed Antique Kentucky Barnwood. All signs intended for outdoor use, such as garden signs and camping signs - are weatherproofed on the painted sign. NO 2 SIGNS ARE ALIKE! GRAND OPENING SPECIAL FREE SHIPPING ON ALL SCRAPPY SIGNS SHIPPED IN THE USA! See Scrappy Signs-For YOUR Garden at the link below. Order Custom Scrappy SIgns here. You can get any wording your want on your sign! OPEN! 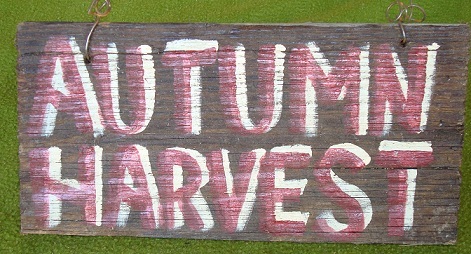 "AUTUMN HARVEST" SIGN APPROX 18"L X 7"W X 1/2" THICK IN SIZE. PAINTED IN BARN RED AND CREAM LETTERING. WIRE FOR HANGING. MADE FROM RECLAIMED ANTIQUE KENTUCKY BARNWOOD. SOLID WOOD, DISTRESSED. POLYED FOR OUTDOOR USE. This sign is a great gift idea. Can be hung outside or inside. Great wall or door decoration. Other lettering colors are available, and can be ordered below. Specify other colors in the area below. This item is in stock in the color shown, for immediate delivery. *FREE DELIVERY IN USA. Other colors may require an additional day for processing. "BOO!" SIGN APPROX 14"L X 7"W X 1/2" THICK IN SIZE. PAINTED IN ORANGE AND CREAM LETTERING. WIRE FOR HANGING. MADE FROM RECLAIMED ANTIQUE KENTUCKY BARNWOOD. SOLID WOOD, DISTRESSED.POLYED FOR OUTDOOR USE. This sign is perfect addition to your Halloween Decor. Also great gift idea. Can be hung outside or inside. Great garden decoration. Other lettering colors are available, and can be ordered below. Specify other colors in the area below. 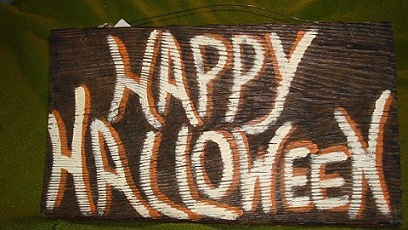 "HAPPY HALLOWEEN" SIGN APPROX 20"L X 10"W X 1/2" THICK IN SIZE. PAINTED IN ORANGE AND CREAM LETTERING. WIRE FOR HANGING. MADE FROM RECLAIMED ANTIQUE KENTUCKY BARNWOOD. SOLID WOOD, DISTRESSED.POLYED FOR OUTDOOR USE. 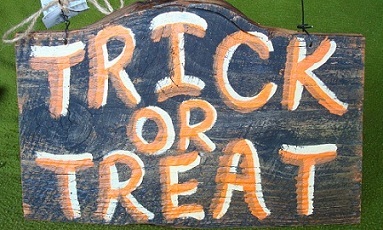 "TRICK OR TREAT" SIGN APPROX 16"L X 10"W X 3/4" THICK IN SIZE. PAINTED IN ORANGE AND CREAM LETTERING. SOLID OAK BARNWOOD WITH BLACK PAINT ON ONE SIDE OF THE BOARD. WIRE FOR HANGING. MADE FROM RECLAIMED ANTIQUE KENTUCKY BARNWOOD. SOLID WOOD, DISTRESSED.POLYED FOR OUTDOOR USE. THE SHAPE OF THIS TRICK OR TREAT SIGN IS ONLY AVAILABLE ON THIS SIGN, SO THIS SIGN IS NOT AVAILABLE IN OTHER COLORS. IT IS A ONE OF A KIND ITEM. HANDCRAFTED. "ALWAYS KISS ME GOODNIGHT" SIGN APPROX 18"L X 9"W X 1/2" THICK IN SIZE. PAINTED IN BLACK AND CREAM LETTERING. WIRE FOR HANGING. MADE FROM RECLAIMED ANTIQUE KENTUCKY BARNWOOD. SOLID WOOD, DISTRESSED. POLYED FOR OUTDOOR USE. "ANTIQUES AND OLD STUFF" SIGN APPROX 22"L X 10"W X 1/2" THICK IN SIZE. PAINTED IN BARN RED AND CREAM LETTERING. WIRE FOR HANGING. MADE FROM RECLAIMED ANTIQUE KENTUCKY BARNWOOD. SOLID WOOD, DISTRESSED. POLYED FOR OUTDOOR USE. "FAMILY" SIGN APPROX 14"L X 5"W X 1/2" THICK IN SIZE. PAINTED IN RED AND YELLOW LETTERING. WIRE FOR HANGING. MADE FROM RECLAIMED ANTIQUE KENTUCKY BARNWOOD. SOLID WOOD, DISTRESSED. POLYED FOR OUTDOOR USE. "DAD'S GARAGE" SIGN APPROX 16"L X 10"W X 1/2" THICK IN SIZE. PAINTED IN BLUE AND WHITE LETTERING. WIRE FOR HANGING. MADE FROM RECLAIMED ANTIQUE KENTUCKY BARNWOOD. SOLID WOOD, DISTRESSED. POLYED FOR OUTDOOR USE. "MANCAVE" SIGN APPROX 18"L X 5"W X 1/2" THICK IN SIZE. PAINTED IN BLUE AND WHITE LETTERING. WIRE FOR HANGING. MADE FROM RECLAIMED ANTIQUE KENTUCKY BARNWOOD. SOLID WOOD, DISTRESSED. POLYED FOR OUTDOOR USE. "HAPPY HOUR, IT'S 5:00 SOMEWHERE" SIGN APPROX 18"L X 9"W X 1/2" THICK IN SIZE. PAINTED IN BLUE AND WHITE LETTERING. WIRE FOR HANGING. MADE FROM RECLAIMED ANTIQUE KENTUCKY BARNWOOD. SOLID WOOD, DISTRESSED. POLYED FOR OUTDOOR USE. This sign is a great gift idea. Can be hung outside or inside. Great wall or door decoration. Below is a list of stock phrases for Scrappy Signs available for order. Welcome to the Nut House — I Hunt Because My Wife Can’t Climb a Tree — GREETINGS, FAMILY AND FRIENDS SIGNS IN STOCK! Grandma’s Kitchen-Tasters Welcome — Nana’s Kitchen- Memories Made Here– ,SPRING, COUNTRY, GARDENING, COLLECTING SIGNS IN STOCK!